Low-carb diets limit carbohydrate intake by removing foods such as bread, rice and pasta from the diet. These types of diet may also remove many fruits, vegetables and whole grains. Depending on the type of diet chosen, participants may consume large quantities of protein-rich foods, such as meats, eggs and dairy to compensate for the missing carbohydrates. A possible side effect of a low carb diet, according to After 50 Health, is hair loss. To understand how a low carb diet might cause hair loss, one should be aware of what hair is and how it grows. Hair is composed of two parts: the strand and the root. The root is a small bulb of living tissue that sits below the surface of the skin inside a pocket called a follicle. The follicle provides the root with nutrients and oxygen through a network of tiny blood vessels. The strand is the visible part of the hair and is non-living tissue. The strand is made of long chains of a protein called keratin and has three layers: the medulla, cortex and cuticle. The cuticle is the outer layer of the hair, it resembles layered scales and protects the cortex and medulla from damage. Hair has two growth phases: The anagen phase and the telogen phase. During the anagen, or growth, phase the hair grows steadily for two or three years. During this phase, the hair can grow as much as 1/2 inch per month, depending on heredity and other factors. During the telogen, or resting, phase the hair stops growing for up to three months. 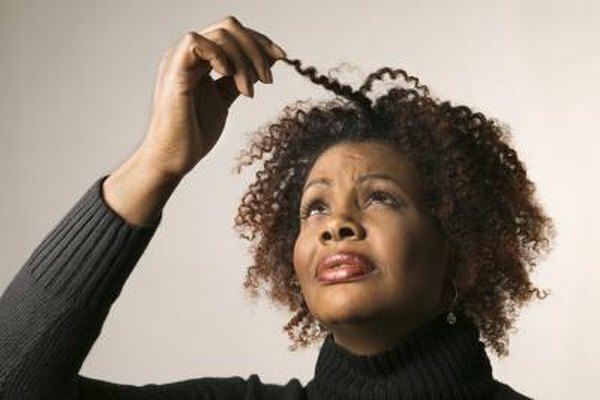 Approximately 10 percent of all hairs go into resting phase, while the remaining 90 percent stay in the growing phase. At the end of the resting period, the resting hairs go back into the anagen phase, where new hair starts growing and pushes the old hair out of the follicle. Carbohydrates are calorically dense, and removing large quantities from the diet also removes a significant source of calories. These types of diets may also create vitamin and mineral deficiencies, depending on the severity of the restriction. For example, Phase 1 of the Atkins diet allows several salad greens but only allows 20 g of carbohydrates a day — 300 g per day is the typical recommended amount. Because the number of allowed carbohydrates is so low, dieters may not consume enough fruits and vegetables to provide enough nutrients. The body uses carbohydrates for energy to fuel all the processes in the body. Low-carb diets rob the body of its preferred fuel, forcing it to break down fat for energy. Additionally, these diets restrict calories by removing several foods from the diet. The combination of caloric and nutritional restriction puts the body under stress, which can cause the hair to go into telogen effluvium. After 50 Health: Does a Low Carb Diet Cause Hair Loss? Mayo Clinic: Low Carb Diet, Can It Help You Lose Weight?